Using simple passwords, like one's name or birth date is never a good idea, but neither is loosing a password, because of its complexity. This is exactly why password managers exist. 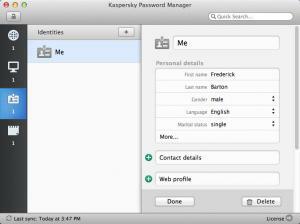 A good example is Kaspersky Password Manager, which you can use to keep your sensitive information secure. Instead of committing multiple passwords to memory, you only need to remember one password. When launched, the application will prompt you to create a master password. This is the password you have to remember and keep safe at all costs, because you will need it to access your database. The application lets you store login credentials for the web, for local applications, identity-related information and personal notes, in separate sections, which you can access them via navigation buttons, located on the left edge of the interface. Creating any kind of database entry doesn't involve anything more than filling in a series of input fields. A particularly useful feature is the possibility of setting the application to log you into your online accounts automatically. While viewing an account's database entry, you can just click a button and Kaspersky Password Manager will launch the login page and fill in your username and password automatically. Besides logging you in automatically into an online account, Kaspersky Password Manager can also fill in the necessary information to create one. If you store enough information in the Identity section, you will be able to fill in all the input fields with a single click, when creating an online account. Even if you have a dozen accounts, with complex passwords, you may keep track of them without any effort, thanks to Kaspersky Password Manager's clean and efficient functionality. You can store and manage login credentials. The application lets you categorize your data in an efficient manner. It can log you into an online account and it can fill in sign-up forms automatically. The free version is limited to 15 passwords. You can download Kaspersky Password Manager free here.